Today I was at a gathering that brought together environmental sustainability leaders from different campuses across the lower mainland. There, I met a handful of extremely bright individuals who were glowing with passion for tackling climate change. There, too, I met my stranger of the day. 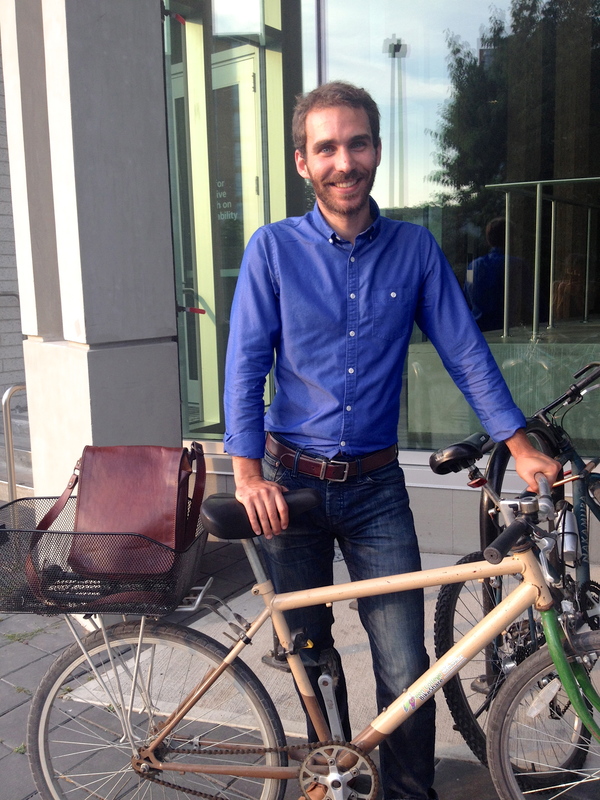 Meet David — a masters student in ecological and natural resources planning at UBC. We bonded over our mutual love of words. After all, it doesn’t always have to be a matter of semantics. Sometimes, it can be a matter about them. (Is this very argument just a matter of semantics? I sometimes find myself wondering… both about this and how it is that I actually have friends. Point and case: it’s always nice to meet other word-lovers). For a long time, David used to have a big long beard. After a while, it was like it became a part of his identity. “I was no longer David. I was ‘beard guy'”, he said, with the nostalgic tone of an identity crisis. When he got rid of the beard, it suddenly became a big topic. All of his friends seemed to have an opinion about it. A couple of his friends were even angry with him. David traveled to Hong Kong at one point for an exchange program. While he was there, he grasped a better understanding of a foreign language: French. Not Mandarin, not Cantonese, but French (although, I’m sure he learned those too). It turns out he met a French girl while he was there and, well, the rest was l’histoire. David learned about a year and a half ago that he has a condition called prosopagnosia — an inability to recognize and remember faces. When he learned that this was a real condition, a lot of his previous interactions and experiences began to click. Although faces don’t trigger his recognition, his memory lingers in other characteristics of the people he meets — like, he described, “by the tones and cadences in their voices”. When I told him about my project, he told me about a time when he met a stranger (his train of thought was outrageously opaque). He had just finished writing a biology exam. He’d finished early, and happened to meet a girl in the corridor who had finished early as well. They had never met before, yet after just two minutes of talking to one another, she asked him if he wanted to grab lunch. Shortly after this, they were sitting on a grassy hill, when she started telling him about an outdoor camp she worked at. One of the counsellors had gone missing at the camp, and a search and rescue team was put together. Since she was a qualified lifeguard, she was asked to search the water bodies, where in the water, she found the body lying cold and still beneath her. In sharing this with David, it was like she had unloaded a burden, embracing such intimate vulnerability and depth in her simple interaction with a stranger. Since that day, David has bumped into this stranger multiple times — once even on a different continent, where she gave him a book for the plane ride. He still has the book. Although we only spoke briefly, I can tell David is a humble human. Despite the fact that I was seeking to learn more about his story, he kept telling me about the stories of the amazing and interesting people he’s met. Although this prevented me from learning the details of his story, it allowed me to see a bit of his character, in the way he cherishes and honours the lives and challenges and accomplishments of those around him. He told me about a quote he likes: “a wise [wo/]man can learn more from a fool than a fool can learn from a wise [wo/]man”. He recited it verbatim, though urging against its political incorrectness in its exclusive use of male gender pronouns. I was thinking the same thing. It was a sweet breath of fresh air to hear it from someone else — a male someone else, too. Then we hugged goodbye, hopped on our bikes, and parted ways.